Traveling with a family presents some challenges. We have addressed a few so you don't have to. While in London Paddington Station take time to go find the bear! Paddington Bear that is. From a classic British children's tale by Michael Bond, Paddington is a stowaway immigrant from Darkest Peru that has come to London. He is identified by an iconic hat and duffle coat. 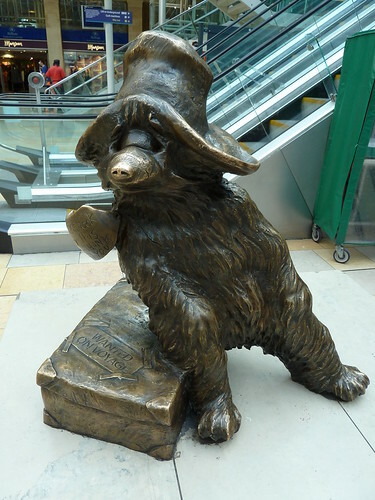 A small statue of Paddington Bear was made and placed in Paddington station in 2000. It is a fairly small statue near the escalators on the main concourse. The section of the station called "the lawn". He is often used as a meeting place in this very busy rail station. If one of your young ones finds Paddington cute, there is a kiosk near by that has plenty of bears for sale. You will find them in all shapes and sizes. They should all have a tag attached to his coat that reads, "Please look after this bear. Thank you."